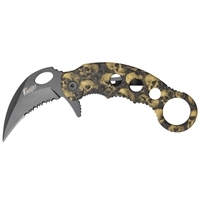 These spring assisted opening folding knives feature a nylon fiber handle coated in a black, camo, or skull design. Each has a black, half serrated blade. 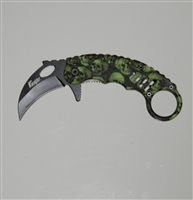 Blade: 3.625"
These spring assisted opening folding knives feature a nylon fiber handle coated in a black, camo, or skull design. Each has a black, half serrated blade. Blackened stainless steel blade with an copper/gold color aluminum handle. Includes a pocket clip. 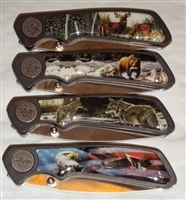 Closed: 4.75" All stainless steel assisted opening folding knives. Each design has a matte silver finish on the blade and handle. Karambit style assisted opening knives. All stainless steel assisted opening folding knives. Each design has a matte silver finish on the blade and handle. Karambit style assisted opening knives. All stainless steel assisted opening folding knives. Each design has a matte silver finish on the blade and handle. 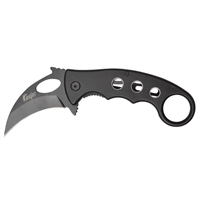 Karambit style assisted opening knife. (Details coming soon) MTech USA Officially Licensed USMC Knife, SideWinder model. This is a well made and versatile folding pocket knife. Super fast assisted opening partially serrated blade is ready to take on any challenge. The MTech licensed USMC knife is also equipped with a glass breaker and a cord cutter. 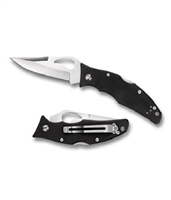 Very sharp edge, liner locking and includes a pocket clip. Blade length is approximately 3.25", overall length opened is 8.5" Good knife for the money. Brand new in box. Clip-point blade has an upswept tip delivering cutting power where you need it most when performing detailed, precise cuts. Comes in combination edge. G-10 is an epoxy filled woven glass fiber composite used for it's lightweight strength and ability to shun chemicals and extreme temperatures.